Once you’re all finished with your nursery’s interior design and decor, there are still a few steps to take before it’s completely ready for your baby to arrive! 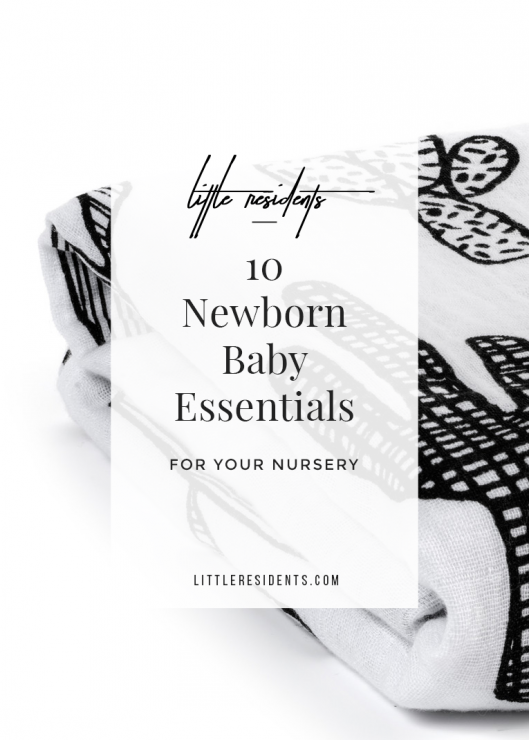 We’ve created our list of newborn baby essentials for your nursery. These are items that many of our second time moms let us know are totally necessary when stocking their baby nurseries. Not only are these Sleep N’ Play onesies by Cat & Jack cozy, but they’re also organic and have an inverted zipper that makes changing (whether clothes or diapers) a breeze! We love the muslin swaddles from Modern Burlap. Why muslin? It is known to be a safer alternative to other fabrics to protect your baby from overheating and reducing the risk of SIDS. The material is lightweight, breathes well and helps to regulate your baby’s body temperature! These can be used not only to swaddle baby, but also as a regular blanket or a floor blanket during playtime. This “docking station” for your baby is raved about by many of our clients. It’s not only high quality, but the DockATot is a multi-use item, and is great for lounging, tummy time, diaper changes (cover it) or even co-sleeping. If you’re breastfeeding and happen to need to buy a nursing pillow, Boppy provides one that is also a great alternative to this item as well! We know that you’ll love rocking your baby and swaying from side to side, but there are times when busy moms need to get things done. We love these rockers from 4moms or Fisher Price to step in and handle the rocking your newborn baby needs while you’re on other mommy duties! When it’s time to go out and about, we’ve got you covered with this newborn baby essential! We’re obsessed with the amazing prints and designs for Milk Snob Covers which work not only for carseats (protecting your baby from the sun, wind, rain, and onlookers) but are great for use as shopping cart or even nursing covers. We want to protect those precious little faces, so these organic cotton baby mitts are definitely a newborn must-have item. We love these adorable ones from the Happy Hen Baby’s Etsy shop. To keep an eye on your baby even when you’re not in the same room, a baby monitor has always been a newborn baby essential. Paired with technological advances, you can say goodbye to the simple walkie-talkie monitors of yesteryear (okay, they actually still make some pretty awesome ones like that) and say hello to monitors with a camera so that you can hear AND see your little one. This Infant Optics Baby Monitor boasts rave reviews. If you’re lucky you’ll have a good start-up supply of diapers from any shower or parties, but if not (or when they run out) then you’ll definitely need to stock up on some diapers (and wipes)! We love these Pampers Swaddlers for Newborns because of their colored line that appears when your baby’s diaper is wet. S-M-A-R-T! Making sure that your baby is ready for bath time is something that may easily get overlooked, so this Aveeno Baby bath set is perfect! Keep your baby close for comfort while still being hands-free. We love this Solly Baby wrap! What are some newborn baby essentials that you found key to have your nursery stocked with?